In life, it’s always nice to return favours. If someone buys you a coffee, you should try to return the favour. If someone helps you move, you should definitely try to return the favour. 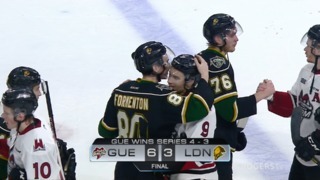 The London Knights returned that favour on Friday night as they defeated the Barrie Colts 3-2 at Budweiser Gardens. Friday’s game took a shootout for London to get the win, largely thanks to the work of rookie Colts goaltender Jet Greaves who made 50 saves in the game. The Knights came out flying in the first period and outshot Barrie 21-4. Not to be outdone, the biggest save of the period fell to Joseph Raaymakers of the Knights who stopped Ryan Suzuki point-blank in front of the London net on a five-on-three Colts power play with just seconds remaining. 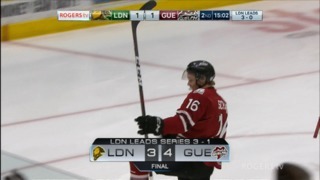 Connor McMichael scored a goal and got the shootout winner for London. Kevin Hancock scored the other goal for the Knights. Liam Foudy’s 10-game goal streak came to an end but Foudy stretched his point streak to 12 games. He has 12 goals and seven assists for 19 points during the streak. The Knights kept pace with the Ottawa 67’s who edged the Guelph Storm 4-3 in overtime in Ottawa on a goal by Kyle Maksimovich. London is two points behind the 67’s with two games in hand. The Knights will be looking for a sixth straight victory as they host Kitchener on Saturday. 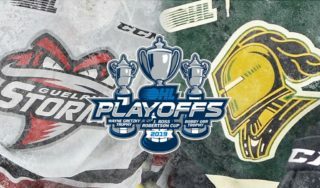 The London Knights killed off one minute and 39 seconds of a two-minute five-on-three disadvantage that split between the first and second periods, but Jacob Tortora slipped a puck underneath Joseph Raaymakers and just across the goal line just 16 seconds into period two. That gave the Colts a 1-0 lead. Kevin Hancock tied the game at 14:51 of the second as Liam Foudy brought a puck across the Barrie blue line, absorbed a hit and got the puck to Cole Tymkin who threaded a pass to Hancock in front and he flipped a shot over Jet Greaves for his 80th point of the season. Foudy’s assist stretched his point streak to 12 games. 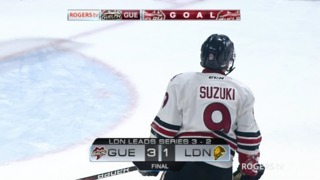 Ryan Suzuki appeared to put Barrie in front as he finished a two-on-one at 5:28 of the third period, however, a fight started in behind the play and after a review, it was ruled that the goal would not count. Less than two minutes later, Connor McMichael scored a goal that did count and put London ahead 2-1. With time ticking down and their goaltender on the bench, the Colts got a puck in front of the Knight net and Barrie captain Jason Willms knocked it in with 18.7 seconds remaining in regulation to send the game to overtime and eventually a shootout. McMichael scored the lone goal of the shootout and Raaymakers made two saves (Ryan Suzuki lost the puck on his attempt) and London skated away with the win. Liam Foudy became the first Knights player to score at least one goal in ten consecutive games since Patrick Kane put together a 13-game goal streak in his only season in London in 2006-07. Kane ended that year with 62 goals and 142 points to lead the Ontario Hockey League in scoring that season. Foudy engineered a 13-game point streak in 2017-18 and was selected 18th overall by the Columbus Blue Jackets in last summer’s NHL Entry Draft. While his goal streak ended against Barrie on February 1, his point streak remains alive, one shy of that 13-game career high. The Knights will host the Kitchener Rangers on Saturday night.